Why does New York get their own Pepsi cans? 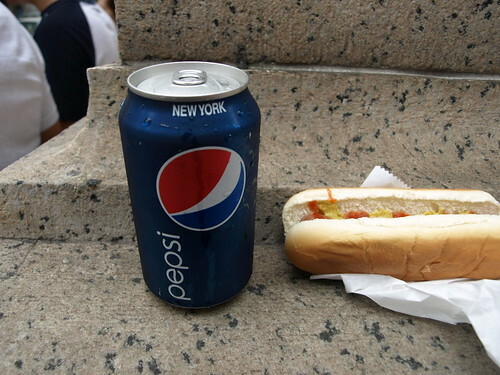 NEW YORK — Since at least the mid 1990s, Pepsi cans sold by food carts in Manhattan have always said NEW YORK. I don’t recall seeing this in any other city. Granted the other cities that tend to buy from food carts are Washington and Arlington (actually a county, of course) so I can’t speak to say Boston or Chicago, but I have a feeling its just a New York thing. Why don’t other cities do it? 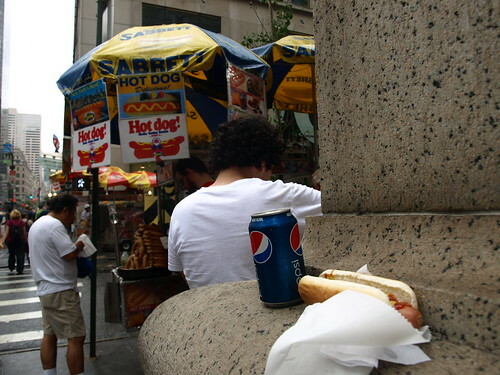 By the way, a Sabrett and a can of Pepsi is a requirement of any trip to New York for me. Might it have something to do with the 5-cent (or whatever) deposit that (I'm guessing) you can get back for turning in your Pepsi can in New York for recycling? Again, I'm just groping here, but it would keep New York from shelling out money on out-of-state Pepsi cans. Do Coke and other beverages do this, I wonder? The Pepsi-Cola bottling co. of NY puts that on all of their cans of Pepsi products. They also make Canada Dry products, but they don't put the "new york" on on those, only Pepsi products. Both say on the back "PREPARED BY PEPSI-COLA BOTTLING CO. OF NY, COLLEGE POINT, NY 11356", but only Pepsi products say "NEW YORK' over the logo. Strange how that works. You probably don't see them anywhere else because they only have Pepsi bottling territory in the 5 boroughs and Westchester Co. They have Canada Dry territory as far south as Monmouth, NJ. It has nothing to do with the refund. I buy drinks in NJ which are made by Pepsi Bottling Group and have no "NEW YORK" on top, but it still says "NY-5cent Refund" on the back.